What Is Velocity Based Training (VBT)? 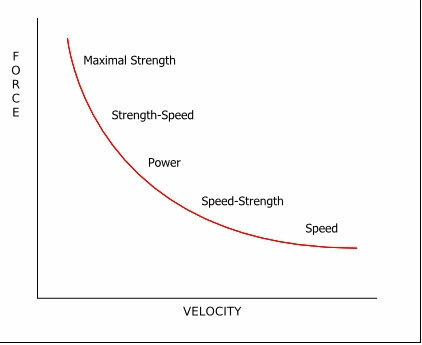 Velocity and acceleration are key factors that decide success in most sports. But what exactly is velocity based training and how can it boost performance, strength and power? Are you one of those gym-goers that knows what to do in the gym but just doesn’t seem to get the results you’re after? If so you’re not alone. Your strength isn’t increasing as much as you expected and your physique is lagging, even though you’re giving it your all. There’s something missing but you just can’t quite put your finger on it. It’s time to take a look at the new science of speed and power strength… velocity based training. Velocity based training is a method of weight lifting where you use a tracker on the bar to assess the speed of movement and when fatigue is kicking in. Velocity based training (VBT) is being used more and more nowadays; by everyone from elite strength coaches to personal trainers and serious athletes. As a training system it helps you optimize progress and keep workouts short, sharp and productive. Velocity based training isn’t just about how fast you move a bar though. It’s about the effort you need to put in to move it. Think speed and power and you’re just about on the money. As a way of tracking training programs, VBT has actually been around a fair while. But it’s only recently (because of high profile coaches choosing to use it) that velocity based training has become more popular. To understand what velocity based training is we’ll have to go on a merry journey through the wonderful world of physics. Don’t worry though, we’ll keep it as brief and relevant as we can. After all, you’re here to improve force and strength output, not take a science major. Just look at it like this; science and gains go hand in hand like peanut butter and vanilla whey. Or a muscle pump and a selfie. They just work well together. 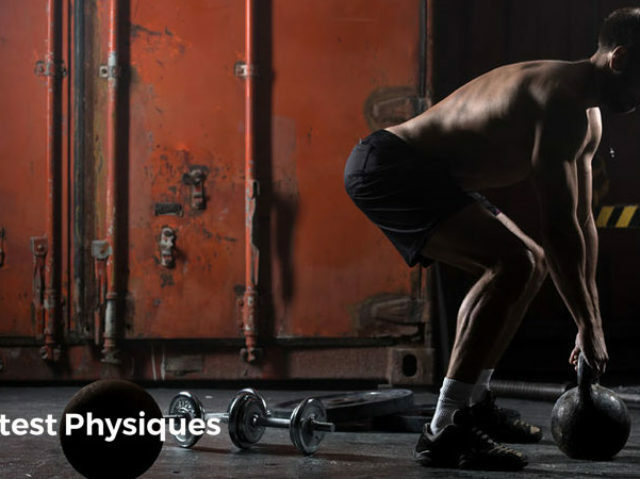 Training in the gym is just a physics experiment put into practice. Only you’re wearing your gym wear instead of a lab coat and thick-rimmed goggles. When you lift a heavy load you have to apply high levels of force to move it. The nearer you get to your 1-rep max the slower the bar will move as you use every single last ounce of strength to shift it. But if you were to train using light weights you’d notice that the speed at which you can move it is much faster. It’s at a higher velocity. Key Point: Velocity refers to the speed at which an object moves from its starting position as a function of time and motion. As velocity goes up, force comes down – because if a weight is light enough to move quickly you don’t need to apply much force to it to make it move. As force increases, velocity goes down – heavier loads can’t be shifted quickly because your muscles can’t fire fast enough. If you lift heavy weights day-in, day-out you’re training your body to improve the way it delivers high levels of force. And likewise, if you train fast but with light weights, you’re training your body to cope with higher velocities. Training at different points across the F-V curve results in different adaptations. Your body ONLY adapts to the stimulus it’s provided with (this is one of the reasons why cycling on a recumbent bike for 5 minutes won’t make your arms grow for example). The theory of the F-V curve is that each of these points across the curve refers to a specific velocity of movement. And by using systems such as velocity based training you can pinpoint specific adaptations and then work on them. You want to boost speed? Work at a specific velocity. Trying to ramp up maximal strength? That’s a different velocity. We’ve already said that heavy weights are slower to lift. And even lighter weights start to get slow as fatigue kicks in and the load begins to feel heavier and heavier as you grind out rep after rep. The ‘minimum velocity threshold’ is the speed at which the rep of a set is completed. Any slower and the rep will result in muscle failure. In other words, if you don’t lift a weight fast enough as you approach fatigue you’ll fail the rep and have to dump the bar. The idea with VBT is that every rep should be as explosive as possible. So why is velocity based training important? What are the benefits of velocity based training? Velocity Based Training Tools – How Do You Maximize Progress with VBT? Using bar speed and velocity as a marker of workout quality isn’t a new method of training as such. It’s just that with the advancement of sport science equipment, it’s easier to buy and set up than it used to be. You can now get a hold of small, portable equipment that measures velocity. And once you’ve used the equipment to calculate rep velocity know this, you can choose the most appropriate loads to train with for maximal performance. Let’s be right – we all like a bit of science when we train as it makes us feel like real athletes. You might not necessarily need all of this equipment. These are just some of the things that athletes and coaches have used themselves. A linear transducer is basically just a tool that measures speed and power when you lift a weight. It can track performance during training and tells you your exact velocity profile and power output. Previous research shows us that using velocity zones helps optimize progress. This ties back into the F-V curve principles. You can see from the chart above that the velocity of the bar during lifting significantly affects the result. Faster speeds lead to speed strength, whereas slower speeds result in more maximal and absolute strength. Starting strength (>1.3 m/s) – moving a weight as fast as possible to prioritize speed. Strength speed (1.0 – 0.75 m/s) – Moderately heavy loads moved as fast as possible. This VBT range maximizes dynamic effort and strength at faster speeds. 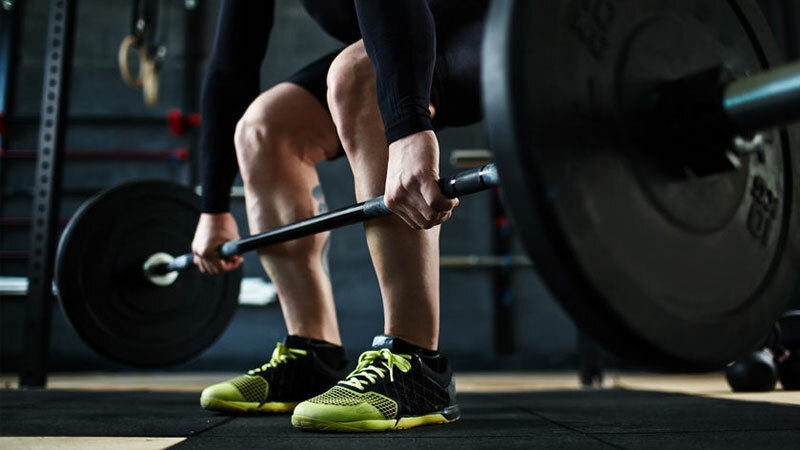 Accelerative strength (0.75 m/s – 0.5 m/s) – Although you’re trying to move the weight as fast as possible, it’s still shifting fairly slowly because of how heavy it is. Absolute strength (<0.5 m/s) – Heavy weights that are or are near your max, lifted as fast as possible (but ultimately will be slow). Common VBT exercise – which work best? Because of its ties to strength, power and athletic ability you’ll not often find athletes performing bicep curls and triceps kickbacks using VBT. It’s a system of training that suits bigger, compound lifts designed to optimize force output. How Do You Program Velocity Based Training? If you’re training to improve a specific quality – speed strength for example – and your velocity decreases out of the specified range because of fatigue, you’re no longer training for that quality. But by using linear transducer and monitoring bar speed you’re able to objectively tell when a set is finished. Once you dip below that threshold, you know your set is over. 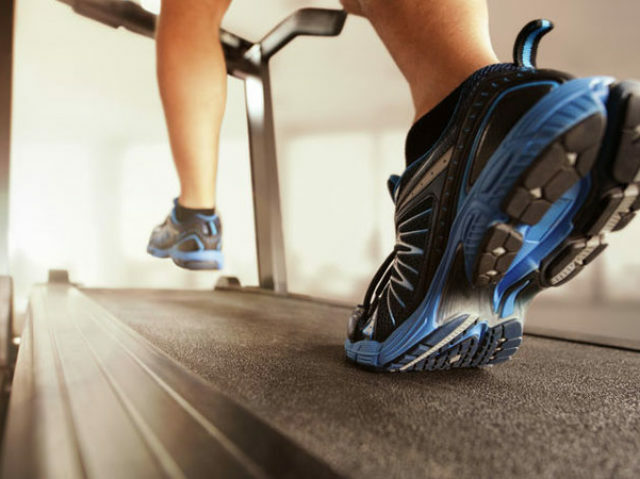 You might be able to grind out a couple of extra reps if you tried, but once the speed hits the minimum threshold, you might as well stop there rather than elevating fatigue for no reason. To do this you just set up your VBT monitor where you can see it. And as soon as bar speed drops you stop and recover before going in again for a following set after a few minutes. 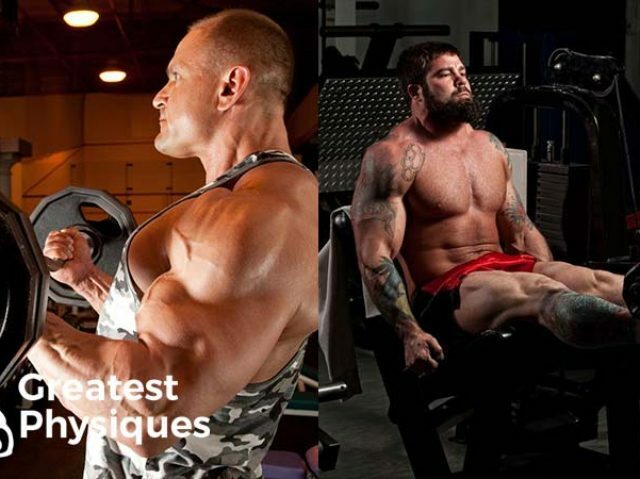 Forget time under tension or aiming for a hypertrophy stimulation. VBT is all about speed. You have to get in the habit of moving the bar as fast as you can for every rep to get the best from velocity based training. That means max effort in every rep, every set. Slowing down will only skew the results and lead to you stopping the set before you should. In this simple example, the program is based on improving both accelerative strength and speed strength in the lower body. 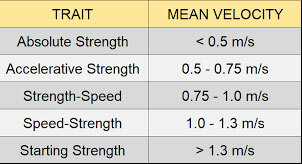 Choose weights that will allow you to complete max velocity reps between 0.75 m/s – 0.5 m/s. Choose weights that will allow you to complete max velocity reps between 1.0 m/s – 1.3 m/s. The Interference Phenomenon: Can Too Much Cardio Decrease Muscle Mass?